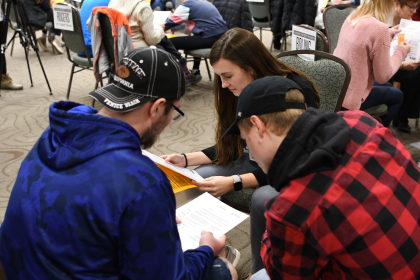 Western students from the Early Childhood Education, Foundations of Teacher Education, Medical Assistant, Human Services, and Occupational Therapy Assistant programs participated in the Great Rivers United Way’s hunger simulation on Monday, March 11. Participants were randomly assigned an identity within a family facing a unique set of challenges. The goal of the program was to challenge participants’ preconceived notions about poverty, and learn about ways individuals must navigate the systems of community resources. Roughly 80 students participated in the event.